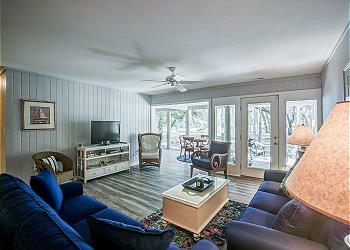 Located on the 10th fairway of the newly renovated Atlantic Dunes Golf Course in Sea Pines Plantation, 564 ocean course is a beautifully decorated 2 bedroom, 2 bath villa. Quite spacious, comfortable, and wonderfully decorated this villa has all the makings of a relaxing vacation. Access your private screen porch and enjoy the beautiful lagoon and golf course views. The perfect spot for your morning coffee! The kitchen and bathrooms have just renovated in spring of 2018. Off the living area are the 2 bedrooms. The master bedroom has king bedding and a private en-suite bath. The 2nd bedroom is outfitted with 2 double beds and this room access the full bathroom in the hall. Located close to Sea Pines Center and just a 5-minute walk to the beach this delightful villa is sure to please!